Some of you know exactly what I am talking about. Others, well you are about to find out. 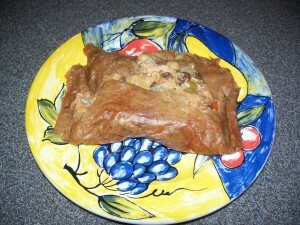 My grandmother used to make the best “pasteles” at Christmas time. They are part of the traditional Puerto Rican delicacies at this time of the year. Along with aguinaldos, the parrandas or carolings, blood sausages and many other indigenous foods of the Island, pasteles are a must in every Puerto Rican household. There are so many recipes; some people make them plain; others put raisins, olives, chickpeas, etc. It is an all day cooking “ordeal”. There were times my grandmother used to send them to me to the states overnight. I have never tasted any like hers. Everything so fresh and meticulously prepared, following the traditional “comida criolla” style. About a year ago I met 2 of my childhood friends in Miami. They also took me to get Puerto Rican pasteles. I don’t know how I could possibly want to make them myself. Upon returning to Delaware I decided I was going to tackle a few of the pasteles. Well, it was sort of a disaster because, of course, I don’t have a banana leaf in sight, and the day I went to get the ingredients, my good old trusted supermarket, did not have a lot of what I needed. Well, I did not despair and still made them. And, you know what? Even though they looked pretty ugly, the taste was very good. A few weeks ago I reconnected with another childhood friend, Aileen, on Facebook. 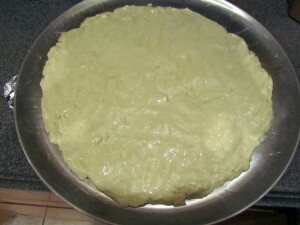 Then I saw a notice to her Facebook “friends”, mentioning that once again she was going to be making pasteles this year. Well, I just immediatedly contacted her. 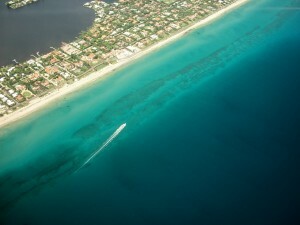 She is located in the town of Deerfield Beach, Florida, south of Delray Beach, about 15 minutes away. What a surprise!! She has more than pasteles. I will give you her information. Her name is Aileen. Her tel. is 239-839-6535. You may also contact her by e-mail at Aileenpasteles@aol.com. She will be glad to send you her menu through e-mail. Seafood Fillings: (special order) Shrimp, crab, lobster, etc. Please call for price. I thought some of you that live in Palm Beach County or nearby counties in Florida would want to know about Aileen’s pasteles. It is so funny that it seems that at this time of the year everyone of Puerto Rican descent wants to be a “jibaro”. I hope you fill your freezer because as you well know the holidays in Puerto Rico start at the beginning of December and last until that last octavita. And, for the ones that cannot be in La Isla Del Encanto during the holidays then there is Aileen’s Pasteles. 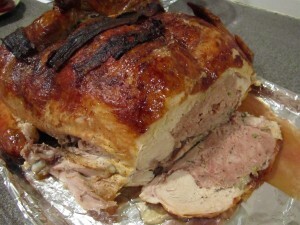 Last week I wrote a post about a Turducken. 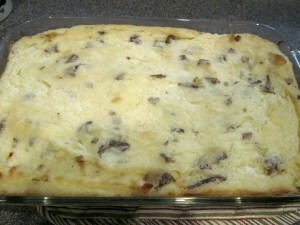 I like trying something new from time to time and the first time I cooked one of these was back in 2006. I later bought one from a grocery store and it was really not good. The company that I have used in the past and is the one I recommend is Cajun Grocer. This company is from LaFayette, Louisiana. Their website is www.cajungrocer.com. In the website you can find all kinds of information about their Turduckens and about so many of the other products they sell. 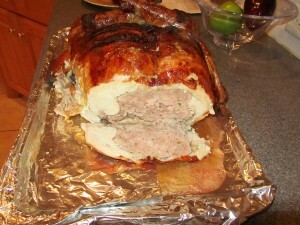 This Turducken had a thin layer of creole pork stuffing between the layers of meat. They offered 3 gluten free Turduckens and I chose the one with the pork stuffing. It is not that the Turduckens are any different if they are gluten free; the stuffing is gluten free. It turned out delicious. I do think that it takes longer to cook than what they recommend; another hour or so. It probably depends on your oven. So here are the pictures of before and after. 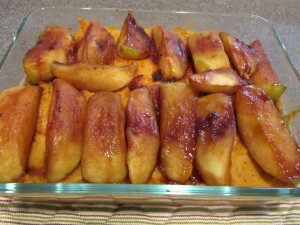 And my side dishes turned pretty good, as well, if I may say so myself. 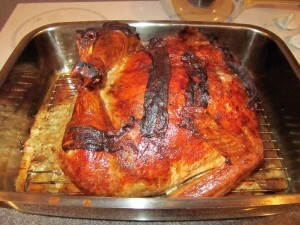 I talked so much about this Turducken that friends, family and acquaintances were curious of the outcome. So now, what would I try next? The Quaducant; Quail, Duck and Pheasant. 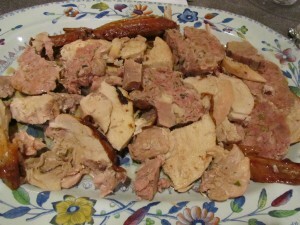 It is breast meat of quail stuffed with breast meat from a duck and then stuffed into a deboned pheasant. 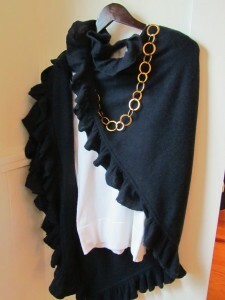 The other day I got an email announcing the grand opening of a new boutique in Rehoboth Beach. I love to hear of new places opening up. 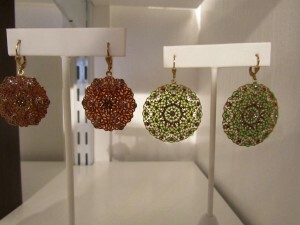 The opening was yesterday, Friday; the busiest day of the Holiday Season. 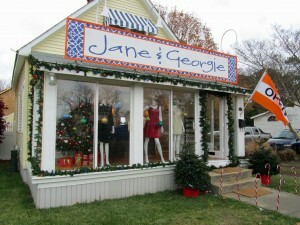 Jane & Georgie is located at 419 Rehoboth Avenue, Rehoboth Beach, DE 19971. 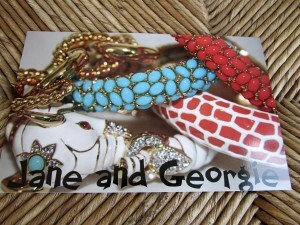 Website is www.janeandgeorgie.com. The owners? Kate Chambers, 302-245-7182 and Lisa Thomson, 302-228-6775. They are sisters!! And you are probably wondering what’s with the name. Grandparents that’s who they were, which both sisters remember with great love and admiration. They both had a unique sense of style. Kate and Lisa decided to dedicate their new venture to them. 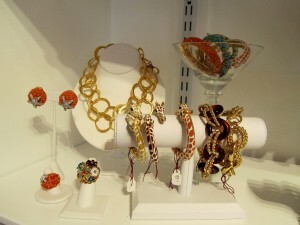 The shop is easy to find; right near the roundabout in Rehoboth Beach. I did not know what I was going to find, but then I saw Kate. This sister, I had met before. She has been in the retail business now for quite some time. I was so glad to see her and she told me that they had started thinking about doing something like this months ago; voila!, they are in business now. It is really a store for women. They are still getting merchandise in and they will be getting some apparel for children, as well. At this time of the year the store opened up in a festive mood. 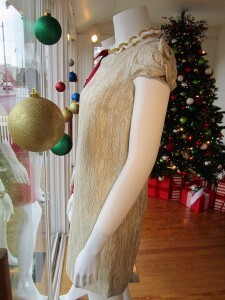 The tree and the lights complemented the dresses first seen as you approached the door. 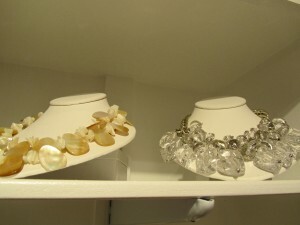 Jewelry, clutches, accessories, very pretty dresses, blouses, shirts, scarves and just about anything we women enjoy to shop for. Jane & Georgie will be carrying jeans; one of the brands is James Jeans. That company is based in LA and supposedly they have created the perfect fitting jeans to hide ones flaws. Music to my ears!! The classic jelly ballet flat shoes with peep toe were from a company called Melissa Shoes. 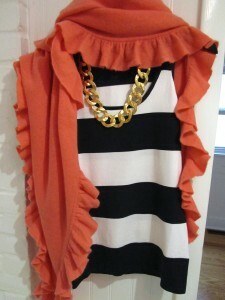 The summer clutch was from Elaine Turner. 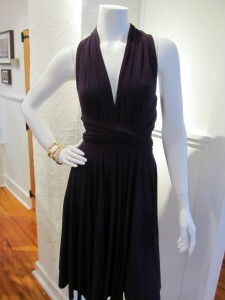 Clothing designers available are Elizabeth McKay, Soshana, Tibi, and Butter by Nadia. 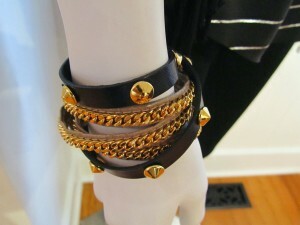 The trendy triple leather bracelets were by Vita Fede and made in Italy. 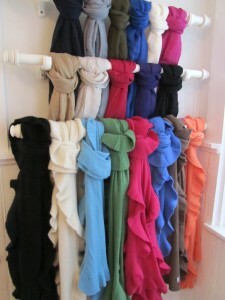 Now that the cooler weather has arrived, the store also had plenty of scarves; some linen, some cashmere and some ruffled. 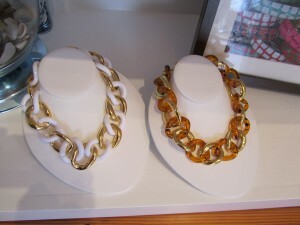 An important accessory for a woman is the jewelry she wears. Jane & Georgie has plenty. 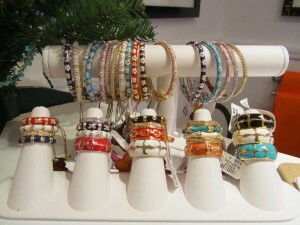 Lauren G. Adams has X Rings, which are stackables and offers plenty of color selections. 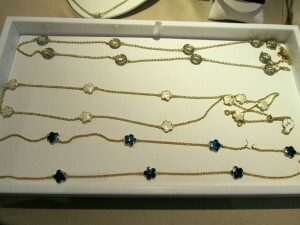 Her flower necklaces are also very popular. 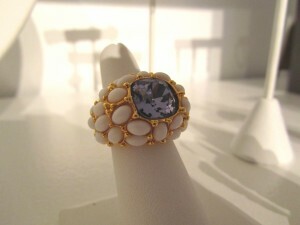 Then there is Kenneth Jay Lane, which is a company based in N.Y. He is kown for being elegant and innovative. 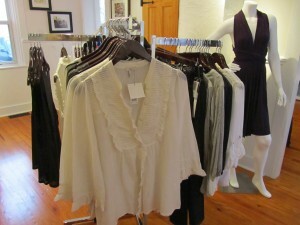 So I have offered you a peak into a new boutique in Rehoboth Beach. You will love Kate and Lisa. 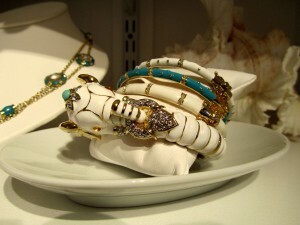 At the present time the shop opens every day. Please note that Jane & Georgie are on Facebook and Twitter. Also, please check their website; very nice. Just like a lot of you, I am in the cooking mode for Thanksgiving. 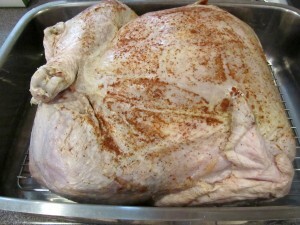 My Turducken is all thawed and as soon as I finish this post I will start making my side dishes. Simple is the way I like my dishes; not too sweet but with a lot of flavor. I have gotten my wish; it is a gray day and cool; leaves are on the ground. Actually, they are all over my deck and yard. I was thinking about all the people that have been traveling since yesterday on planes and cars and I give thanks that on this Holiday, I have stayed home; football games and enjoying the season. 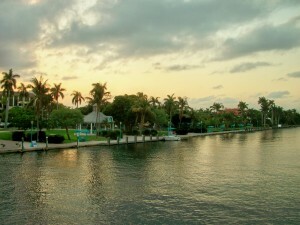 The town of Delray Beach, Florida, is one of those I write about a lot. I do because I have a place there and a lot of people from the eastern shore (Delaware and Maryland) visit this Village by The Sea. It must be that it reminds us of home. The coastal atmosphere and the relaxing way in which we live here at the beach. It still amazes me as I write this, how someone about a month ago wrote to my blog; took the effort to tell me how horrible Delray Beach was and the added comment was that she hated my life. Oh, well, what can I answer to that? To each its own, that’s what I say. I do like Delray Beach; the way the town is set up, the beach is great, fantastic restaurants, little boutiques, lots of activities and events, music to entertain the visitors and residents every day of the week. Gorgeous palm trees and accessibility to walking, biking and running. Old School Square – Cultural Arts Center – 51 N. Swinton Ave., tel. 561-243-7922. website www.oldschool.org. This is a National Historic Site that houses the Cornell Museum of Art & American Culture, Crest Theatre and Vintage Gymnasium, restored in early 20th century school buildings. It is considered the catalyst for the 1990’s renaissance of downtown Delray Beach when historic preservation and the arts became one. Friday, 11/26 – The Holiday Carousel opens for the Holidays. It is a 50 seat carousel for kids and adults. Hours are 5 – 9 p.m. weekdays and 1 – 9 p.m. on week-ends and during the December break. $2. Also on Friday, 11/26 is the very popular Gallery Walk. 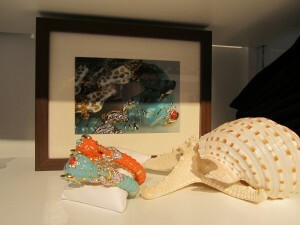 Delray Beach is known for its vibrant art scene; about 20 galleries are found in downtown Delray. On Fridays from 7 p.m. until 10 p.m. the galleries open their doors for a walk. Wine and cheese served at participating galleries. Saturday, 11/27 – Trash & Treasure Community Yard Sale from 8 a.m. until 1 p.m. in the Entertainment Pavilion where the Old School Square is located. Join them for a bargain hunter’s dream. More info? Call 561-243-7922, e xt. 319. Saturday, 12/4 is Cycles, A Musical Journey, at the Old School Square at 8:00 p.m. $30. Drew Tucker, Delray’s percussionist has arranged this musical “feast for the senses”. It combines classical piano with high energy percussion (Blue Man Group-Style). Drew Tucker has performed with Diana Krall, Ed Calle, Arturo Sandoval and Ricky Martin, among others. He is also a teacher and a mentor. Holiday Festivities – The lighting ceremony of the 100-foot Christmas Tree at Old School Square will be on Thursday, 12/2. So many events will start at 5:00 p.m.
For a complete schedule please visit www.downtowndelraybeach.com/holiday-festivities. Thursday, 12/2 – Art & Jazz – On Atlantic Ave. featuring live musical entertainment, open house specials and gallery exhibitions from 6 p.m. – 10 p.m.
Until February 27, 2011 – The Cat’s Meow – A Purrfect Celebration of Cats….Wild to Mild an exhibit at the Old School Square. Saturday, 12/4 and Sunday, 12/5 – Cat Adoptions in the Cornell Museum with Cats Exclusive, Inc. Saturday from Noon until 3 p.m. and Sunday from 10 a.m. until 4 p.m.
Sunday, 12/5 – Art Class Open House. at the Old School Square, from Noon until 4 p.m. – Meet the instructors and take advantage of the incentives for new students. This little Village by The Sea is also very musical; during the week you will hear music emanating from different venues and restaurants. 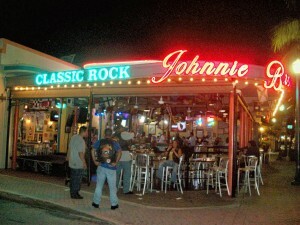 One place that does have music every day of the week, is Johnny Browns. It is located on 301 East Atlantic Ave., right by the railroad tracks. 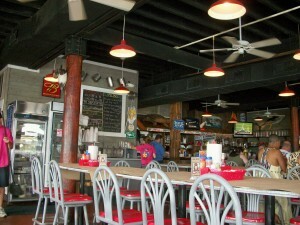 It is also a restaurant with burgers, wings, ribs, and, Classic Rock. Its website is www.johnniebrowns.com. The performers are very good and for all tastes. Sundays – Reggae and classic rock with Usher, West & Battle from 8 until midnight. Mondays – Big Brass Bed – One of South Florida’s best, playing tribute to Bob Dylan and more. That starts at 8 p.m.
Tuesdays – A live tribute to Rod Stewart with The Hot Rod Band. Impersonator, look-alike. All Rod, all Night. Starts at 8 p.m.
Wednesdays – The Flyers – Classic Rock’s Finest – Eric Clapton, Stevie Ray Vaughn, George Harrison, Jimmy Hendrix, and more. 8:00 p.m. I have heard them and they are great!! 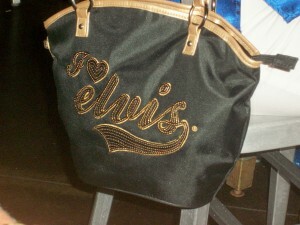 Thursdays is a popular night with a Tribute to Elvis by Scott Ringersen. Two shows at 7:30 p.m. and 9:30 p.m. Have seen this show, as well and he is good with a big following. Friday, 11/26 – Aces’n Kings from 9:00 p.m. until 1:00 a.m.
Saturday, 11/27 – The Johnsons from 9:00 p.m. until 1:00 a.m. Very talented and have seen them as well. A couple of more days until Thanksgiving, in the mean time I was remembering how many crabs I ate this summer; it was an awesome season. If you are into crabs you must have been very happy. Just because summer ends that does not mean that I stop eating them. 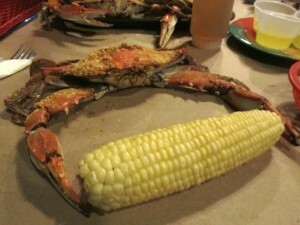 Just like I had a pizza craving in the past week, I started to crave some crabs, as well. The idea of sitting on a paper lined table and sharing a convesation while picking crabs, I find it so relaxing. I had the opportunity to do just that yesterday. 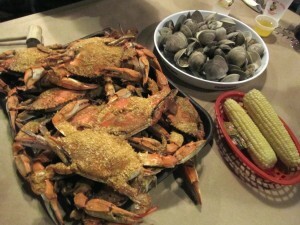 Every time I have to pass through Kent Island, one of my must stop places for crabs is Harris Crab House. This restaurant is located at Kent Narrows Way North, Grasonville, MD 21638. Tel. 410-827-9500. Minutes from the Bay Bridge; Rt. 50/301 take Exit 42 and follow the signs. I must admit that the last time I was at the restaurant, which was about 6 weeks ago I was dissappointed in the crabs served. They were supposed to have been large but I did not think so; paper thin, as well. I was hesitant since it was a Monday and was not sure how they would be . But, they redeemed themselves. The crabs were jumbos; heavy too. Nothing like picking those jumbos; the lumbs were falling right on my hands. Truly delicious. The seasoning, well what can I say but that it was perfect; nice coating. These were local crabs, making a last run during the end of a most amazing crab season. 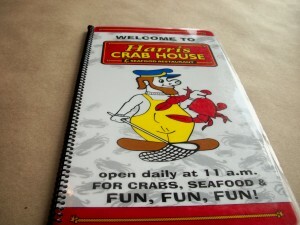 Harris Crab House has other things on the menu and you can check all that on their website. I think all I have ever eaten there are the crabs, steamed clams and oysters. That’s all I go there for. During the summer months, al fresco dining is offered. Yes, dining outdoors, on the water, watching the boats slide by. I have never tried their mailing any seafood but they say that they will mail your order anywhere in the world; just give them a call. They open daily, year-round. 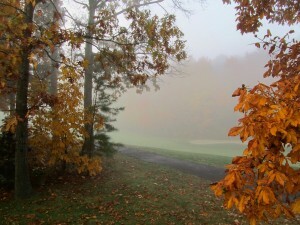 Have a great Fall Day…It is pretty nice out…. I would have thought this week-end would have been a quiet one. I was quite surprised to see the parkings at all the outlets on Highway 1 completely full. But, how could they not be? 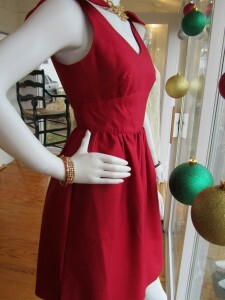 The holiday shopping season is starting earlier and earlier every year. I really don’t get too much into it. I love celebrating the Thanksgiving holiday and taking it one step at a time. This past week we had a beautiful foggy morning and it made appreciate the beaches so much more at this time of the year. 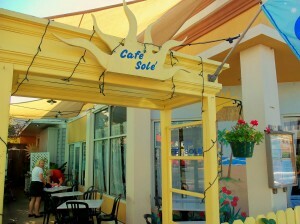 I got an e-mail from Cafe Sole. I really enjoy going to this restaurant. It is cozy, whimsical and the food is great. They are located on 44 Baltimore Ave. During our Second Season at the beaches they open from Wednesdays through Sundays for lunch and dinner. The telephone is 302-227-7107 and the website is www.rehoboth.com/cafesole. 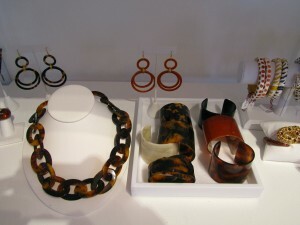 This is what they will be offering on this upcoming holiday plus the winter specials. Wednesdays – Half price dinner entrees. $5 wines, 2 for $10 desserts. If you are planning on having Thanksgiving dinner with them, then you should make reservations. 3:00 p.m. until 7:00 p.m. are the seatings available. 4 Courses for $28.00. Saturdays – Steak & Crabcake Dinner for $20.10. Sundays – Sunday Brunch. Much more than bacon and eggs!! $5 Mimosas and Bloody Marys from 10:30 a.m. until 2:30 p.m.
Santa’s House in Rehoboth Beach – It will be located at the end of Rehoboth Ave. This year you may bring your pet by Santa’s House. Santa will be posing for photos with his furry friends on Saturday, 12/4. There is no charge to visit Santa, but donations are appreciated. Friday, 11/26 – 5:30 p.m. – 8:30 p.m.
Saturday, 12/4 – Pets Visit Santa – 11 a.m. – 1 p.m.
Saturday, 12/4 – 3 p.m. – 5 p.m.
Sunday, 12/5 – 1 p.m. – 3 p.m.
Saturday, 12/11 – 3 p.m. – 5 p.m.
Sunday, 12/12 – 1 p.m. – 3 p.m.
Saturday, 12/16 – 3 p.m. – 5 p.m.
Sunday, 12/19 – 1 p.m. – 3 p.m. The Independent Film Festival had a great turn out. Actually, it was a record setting one with about 18,434 tickets sold. Next year’s festival will be taking place from November 9th until November 13. The Rehoboth Beach Film Society has on going events throughout the year. Their mission is to promote the art of film, to entertain and educate. As part of their series Around the World, which are presented in partnership with the Lewes Library and Movies at Midway, on Wednesday, December 1st, at 7:00 p.m. Only When I Dance will be featured at the upstairs screening room, at Movies at Midway. It is FREE. This documentary follows two teenagers, Irian and Isabela, as they strive to realize an extraordinary dream. One girl, one boy; both black and poor, living in one of the most violent favelas on the outskirts of Rio, Irlan and Isabela want to dance ballet, and their ambition is to leave Brazil to join one of the great companies in North America. For them, dance is the way out, an escape from their challenging lives in Rio. Being on stage brings them to a state of ecstasy that is rarely found in their day to day lives. The question is: can they make it? Only When I Dance is about chasing a dream to dance the most perfect dance against all the odds of race and of circumstance. And, of course, the price you must pay for talent, ambition and success. It runs 78 minutes, not rated and it is in Portuguese with English subtitles. Friday, November 26th – It’s The Rehoboth Beach Tree Lighting festivities from 6 p.m. until 7 p.m. at the Rehoboth Beach Bandstand Pavillion. Sing a long with Doug James and Nancy Joseph will begin at 6 p.m. The lighting will take place at 7 p.m. For more info. 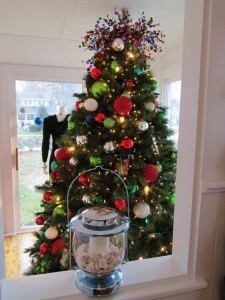 you may call 302-227-2772 or visit www.downtownrehoboth.com. Saturday, November 27th – It’s the Dewey Beach Tree Lighting celebration at 5:30 p.m. until 7:00 p.m. at Fifer’s Orchard Market. Keith Mack and Ed Shockley will entertain with live music and there will be children’s craft activities. Everyone is encouraged to bring their families, refreshments, and their Christmas Spirit to start a new tradition in Dewey Beach. 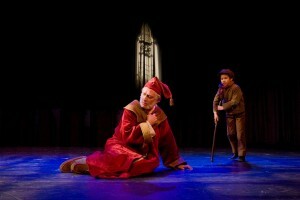 Clear Space Theatre Company will be presenting SCROOGE, a Holiday tradition for the whole family. Location? The Rehoboth Beach Theatre of the Arts, at 20 Baltimore Ave. General Admission is $25, Seniors $20, Students $15 and children under 12 $5. For more information, please call 302-227-2270 or visit the website www.clearspacetheatre.org, where you can get a full schedule and buy tickets on-line. It will start on Thursday, December 2nd at 7 p.m., then it will run until Sunday, December 12th. Monday, December 6th is the Rehoboth Beach Hometown Christmas Parade. It will begin at 6:30 p.m. on Rehoboth Ave. Groups and individuals wanting entry information should contact Mike Simpler at 302-542-4414 or e-mail RBHTCP@gmail.com. Doggies at the Beach will have a float at the Rehoboth Beach Hometown Christmas Parade. Doggies at the Beach is a “no cage” boarding facility in Rehoboth at 18806 John J. Williams Highway (Rt. 24). My dog, Addy, is a frequent visitor and I personally recommend them. Their tel. is 302-644-8200. Their website is www.doggiesatthebeach.com. Please check it out since it is much more than boarding. They also have grooming, obedience classes, vaccination dates, etc. 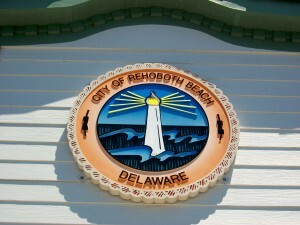 It may be the Second Season but for now Rehoboth Beach is keeping us residents and visitors very well entertained. Thanks!! Have a great Day…..talk to you later…. After spending a few hours with Pete, my handyman, I decided to order a pizza from Nicola. I deserved it. 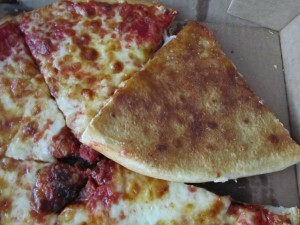 Pete drove me crazy and there was nothing like a slice of pizza for instant gratification. This is the 3rd time I have ordered pizza in a week. Right in downtown Rehoboth Beach, all those 3 pizza joints are within walking distance of one another. So, you have your pick. And we all do; it is a matter of taste. Like Ed, a resident from Rehoboth, who says he can eat pizza every day and has given me other places to try. He has his preferences of what type of cheeses should be used, thickness, and toppings. Last night there was a show on t.v. and it was all about the pizzas in New York City and Chicago. New York pizza won. The difference between the 2? The thickness with New York having a thin crust and Chicago was deep dish pizza. I made my call and ordered a small cheese, well done, and thin. They asked me if I wanted a pan (personal) pizza or the regular. Of course, the regular. It would be ready in 20 minutes and it was. 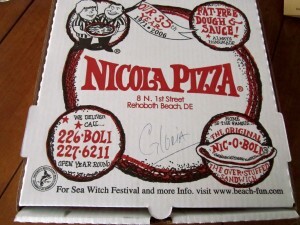 Nicola Pizza does not need any introduction here at the beaches; it is also an institution that opened up in 1971. It is a family business. They are located at 8 N. 1st Street. Tel. 302-227-6211. 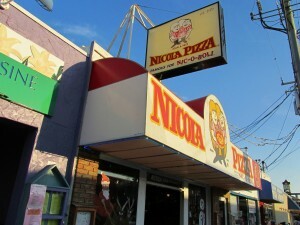 The website is www.nicolapizza.com. Nicola is proud to inform its patrons that they drain the fat from the beef, blend three kinds of cheeses and use homemade sauce. No additives or preservatives are ever used. You can dine in or take out and Nicola has a new location right on Rehoboth Ave., around the corner from the original one. I ordered my take out pizza from the original location. Involved in the community and helping organization to raise funds. For that purpose, just give them a call for more information. Nicola has specials during the winter and stays open year-round for lunch and dinner. They are also the home of the Nic-O-Boli, which is ground beef, their fat free pizza sauce and a blend of cheeses rolled in fat free dough, then baked in the oven. 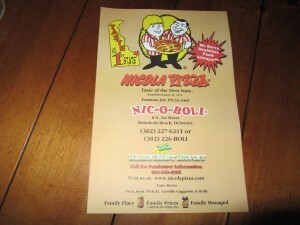 They do also offer specialty Nic-O-Bolis, as well, like no beef, low carb, and a few more. Nic-O-Bolis can be bought by the case, frozen. I have given them as gifts before and always appreciated. Just pop them in the oven. I drove home with my hot pizza and already my car was full of that smell. I rushed into the house and showed it to my husband, who as you know cannot have it because of his gluten allergy. 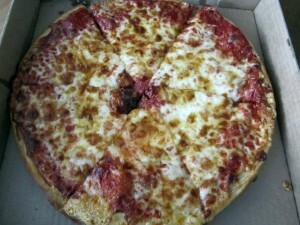 I have not had Nicola’s pizza in some time and I thought it was very good. It was thin, crispy and well done. 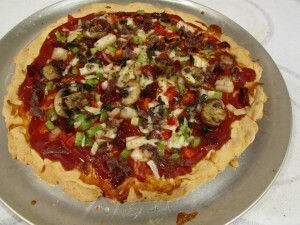 And, the sauce was flavorful and did not overpower the pizza. It came out just like I ordered it. This time I had a couple of pieces and froze the rest in case I had a craving later on. Later in the evening I decided to make a gluten free pizza myself. I had bought gluten free pizza dough. The pizza looked good. 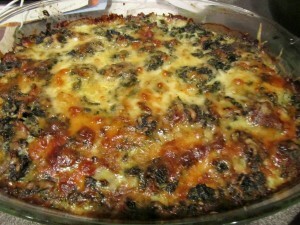 I added cheese, my own sauce, peppers, onions, mushrooms, anchovies, and sun dried tomatoes. It came out too “doughy” . I will have to perfect it. Early in the morning I see the same people walking their dogs around the circle. Actually, some of them are just walking by themselves. Good Morning and Another great Day!! are the comments as they walk or run by. The majority of the dogs are pretty friendly but a few give Addy dirty looks. Today was one of those pretty early mornings. After the walk I came home and I looked at the clock and I knew I had to be in Fenwick Island. It takes about 25 minutes to be there. I had a hair appt. with Colleen. O.k. don’t be so bored already; I am just trying to set up the story. I was relaxing when my husband called me that Pete was waiting for me at home. Well, I did not know he was going to be there to see if he could get my fireplace going. He would have to come back. Just tell him one o’clock. Pete is the type of person that could make you insane. Oh no, he does not just come to fix something. He will tell you many stories about his past. Oh yes, he had high clearance with the government, can pull his own teeth. Hmm, that’s a good one. Today he came in prepared to “teach” me how to fix the fireplace. I immediately told him that I did not have any interest and was not planning on learning that task. We are not very handy in our household; that’s why we have him. It does not matter, he will still explain the whole process. He told me I needed to read him the directions because they were in Spanish. He wanted me to translate them. I said that on the other side, they were in English. I proceeded to read them to him. He was lying on the floor and his physique is a little pudgy so the view from the top was not very good. He got all excited and told me that it was all a conspiracy for all of us to spend more money. The way the directions are written is to create confusion; then you call the company and they charge us for the service call, a lot of money, to fix something so insignificant. Addy was barking at him the whole time and he was barking at her. I gave him one of Addy’s treats so he could give it to her; she was hiding behind the table and he told her she was hiding like Obama. He said Obama was going to go into hiding just like Richard Nixon did because Nixon was involved in the Kennedy assassination; it cannot be proven, though. He still had the fireplace all taken apart. 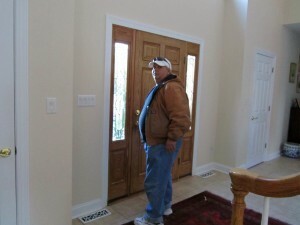 Why is it that my husband is never here when Pete shows up? He said he was taking a break. Where are you going? I asked. Well, he was going to smoke a cigarette. He told me he was smoking 2 packs per day and now he is down to 10 cigarettes. Remember the handyman/painter in Murphy Brown? He is a lot like Eldin. It did not take him long to get back in the house. Finally he put the fireplace together. He said to me “if she don’t work” then it is probably the “little thingy”. I just agreed with everything he said. I made the mistake to ask him what he thought about the weather. That was the wrong thing to ask. He told me I would have to talk to New Mexico. We better get prepared for this coming year. Today was like a typical day back in the 60’s when it was gorgeous and then wham!, the east coast was hit with storms from January until May. He said he predicted this year’s storms. He also had predicted a tsunami a month ago and had gotten some “essentials”. Needless to say, it did not happen. Calgon, please take me away, right now. You know what? The truth of the matter is that Pete is a really nice guy even though he exhausts you with all this information. You need him and he is always available. At least this was not like the last time when he was installing my kitchen sink faucet and he kept on talking from under the sink and I was his assistant. The view from that advantage point was never to be forgotten. Here is a picture of Pete. Yeap, you guessed it. The cigarette break. After he left, I decided to call Nicola Pizza and reward myself with my 3rd pizza of the week. I deserved it. That will be my next post. Have a good evening….talk to you later….